It is time to follow the bouncing ball as we begin the journey through Brackeville enroute to The Final Four. Much of today will be spent upon completion of my NCAA – Division I Men’s and Women’s basketball brackets. This means my thoughtful, high researched, and always snarky comments will come tomorrow. I am very excited that my sister will be playing brackets this year. She, like myself, base our selections on such criteria as: Family Alumni, Conferences loyalties, color of uniforms, coaches’ attire, jewelry, number of tattoos per team, and of course the all-important cross gender criteria – HAIR! – including guestimates of how much hair grease Andy Landers goes through each month. But more on my brackets and criteria tomorrow. The good news or the bad news first? The good news is the Texas Aggies women’s basketball team does not have to go to Waco or Austin to begin First Round play. Neither does the team have to fight the blizzard where the top half of the bracket is playing. The Aggies start The Dance by going to California in beautiful star studded, glitter town – Los Angles! Note: to top half of bracket – That is SUNNY California. Who does your bracket geography? Obviously, long-term, freak weather patterns were not factored into the equation. Notice the “really smart” schools are in California while you are shivering. It is called SPRING break for a reason. The Aggies are the #5 seed in the lower bracket. We will meet the #16 seed Penn State Nitany Lions, Ivy League Conference Champions. Listen up, whatever a Nitany Lion is – We gonna show you some Ivy League, Texas style basketball from the Harvard on the Brazos! Ladies! Let’s Get in Formation! We be getting our Beyoncé on! Did I mention the sun? Where is my Beyoncé bikini? Miss Curtyce Knox assisting me to Get in Formation. As Coach Gary Blair said today, “We are not good enough to look past anyone, but we are good enough to beat anyone, and that includes everyone in the tournament.” Gig ‘Em Aggies! WHOOP! Here’s what I’m thinking: If a network had more programming (as in more schools) one would not have to hear VY and RW doing bad commercials. Instead there could entire shows of National Championships and not just Alabama, but by any number of teams and unbelievable number of athletics. And so my dear friends who pulled for North Carolina are in mourning today as the buzzer beater shot gave Villanova the NCAA Men’s Basketball Championship. Haven’t you learned the Catholic school always wins? I think the NCAA has some kind of contract with the Catholic schools to ensure victory. But this leaves one more dribbling show tonight in Women’s NCAA Basketball Finals. UCONN and Geno and Giants go for a record-breaking four national championships in a row. Where is my barf bag? And I don’t even like the color orange. Reminder: Monday, March 14 – the eve of the Ides of March – is the NCAA Division I Women’s NCAA Selection Show on ESPN. At this time we find out who is “Going Dancing” and where and who is staying home to watch, wiping away the tears and starting practice for next year. Doors open at the Ferrin-Cox Building at 5:00 PM where I will be watching it live with The Fighting Texas Aggie women’s team and GB (Head coach Gary Blair). I hope I get as good a seat as I did last year – right behind the team. Of course there is free food. Why do you think we go when we could watch it on TV? I also hope the Aggies do not get upset in the first round like last year by one of those teams that no one has ever heard of. Who was it? Middle Hillbilly Arkansas State? Here is my 2015 women’s bracket. There are 60 other teams though that could provide an upset to anyone of those four before the Final Four arrive in Indianapolis. Coming soon: How to Fill Out Your Bracket – We will look at how Dr. Beverly Hofstadter and Dr. Sheldon Cooper might do the math calculating the statistical odds of teams reaching The Final Four versus the Penny methodology of “I think their uniforms are pretty and I love the hair styles and what the coaches are wearing – especially the shoes. Oh yeah. I love their mascot – the Beavers.” Both methods are equally valid in selecting a winning team. Gather ye basketballs while ye may, the time is still a flying; And that same team that flies today; tomorrow will be dying. Monday evening the ESPN will air the selection show for the NCAA Division I women’s tournament. Sixty-four teams will be selected to go to the dance. Let’s start with terminology. Automatic bid – these are teams who win their conference or their conference tournament. It is like going to the dance with your long-time boy/girl friend. At large invitation – these are teams who did not win their conference or their conference tourney, but will get to go to the dance. It like hoping you get asked to the big dance by somebody. Bracket – a funny little chart showing which teams play against one another. More to come on brackets after Monday. Bracket Virgins – your first time to complete a tournament bracket. The Dance – the championship tournament is referred to as “the dance.” I do not know why. Final Four – the last four teams left after everybody has played through their bracket. These teams play to be crowned 2016 Basketball National Champions. Hardware/Bling – Hardware refers to the trophy; Bling refers to the BIG diamond rings you get if you win the tournament. The bling is the size of the nob on your dresser drawers. Ticket punched – this is the term that a team received an automatic invitation and is loading the bus or plane to travel to a destination selected by people who actually get paid to watch, analyze and make up brackets for sporting events. Let’s see who already has their tickets punched to the Dance and the conferences represented. Oregon State – Pac 12 – Go Beavers! It is not the usual champ – Stanford. Sorry Tara V. I hope you get an at-large bid. Iona – MAAC Conference. I must admit I was devastated when Iona upset Quinnipiac 57-41. I have never heard of most these teams either and my TV automatically turns to ESPN so do not fret. Still to come – tournament winners from the following alphabet soup of conferences: West Coast; Mountain West; American East, MAC, SWAC, Big Sky MEAC, WAC. No, I have no idea what the letters stand for either. You have Google on your computer, look them up. I think I left out a team. Oh yes – UConn from the AAC. I refer to this team as Geno and his Giants. 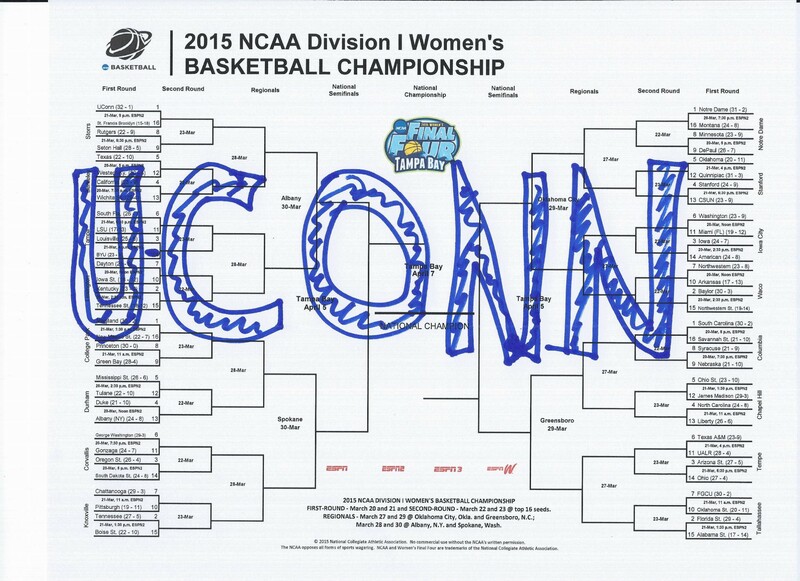 I shall yell for any team playing UConn. The at-large bids will “round out” the field of 64 teams. This should include Texas A&M, THE University of Texas @ Austin, and other teams that are really good basketball teams. Then play begins. There is no tomorrow. You win or you go home. The objective is to continue to play until there are only four teams left. This is called The Final Four. Notice: there are four teams I have bolded. These are my Final Four predictions. Notre Dame, South Carolina, Baylor and UConn. Another prediction: Baylor will win the Championship Game against UConn. But then again it is not called March Madness without reason. Yale or any other team could throw the ball toward the basket on a desperate shot and win on a buzzer beater. A buzzer beater is defined as: with the scored tied and only seconds left to play in the game, a desperation shot is attempted; the ball goes through the basket and the team wins. Shades of Louisville several years ago and all Baylor fans wanted to (or did) throw up. As we wait for Selection Monday, let’s begin to cheer for teams we want to win somewhere in the tournament. Sic’ Em Bears. Gig ‘Em Aggies and yes, even Hook ‘Em Horns. 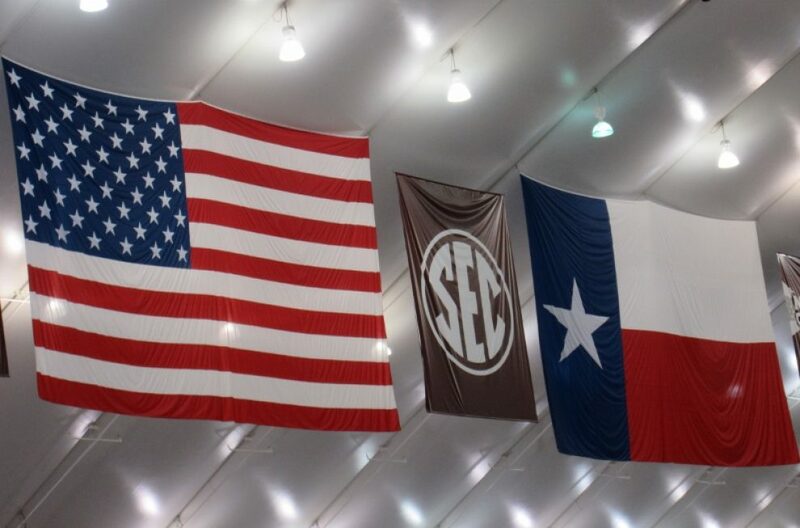 Somebody bring that hardware and bling back to The Lone Star State from Connecticut! Geno and the Giants already have too much hardware and too much bling. It is someone else’s turn for hardware and bling. GB (Gary Blair – Texas A&M women’s basketball coach) and me. Photo by the crazy women who shoved me out of the way to get her photo made with GB. Today’s posting will be delayed due to golf. Unless of course it rains, then I will post my usual profound thoughts for the day. But I did get my basketball brackets completed. I barely got my men’s bracket completed before it busted on the first game. I was really pulling for the Jaspers. I did complete my women’s Division I basketball bracket. Note: this is the team that will win, not the team I want to win. Any other team on the chart is who I want to win.